RAHNERVERSE: The (Digital) Return of Rotten! The (Digital) Return of Rotten! Unavailable for a spell, the acclaimed zombie-western ROTTEN is now back on COMIXOLOGY with a glorious redesign by Eric Trautmann, new introductions and more. ROTTEN VOL. 1: REACTIVATED, long out of print in trade paperback, is on sale now, as well as the standalone king-sized first issue. 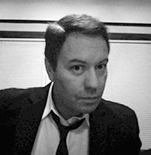 Mark Rahner is a veteran journalist, comic book writer, talk-radio host and podcaster based in Seattle. > Read his bio here.